Is technology impacting children's behavior? In a tech-frenzied world filled with flashing lights, blinking screens, and high pitched computer bleeps, many parents wonder where to draw the line with technology in the home. The American Pediatric Association recommends no more than two hours of television viewing per day, yet many kids exceed this amount in a single sitting. Digital-natives are described as children who have grown up surrounded by all things technical. The digital generation relies on cell phones as their main form of communication, sending texts rather than letters, and emails rather than calls. This form of digital coorespondence lacks the same substance and meaning, posing many to ponder, is technology impacting children's ability to relate in the real world? Once kids graduate school and have to deal with the public face to face rather than behind computer and gadget screens, are they capable of holding eye to eye contact and dialogue? The cons of too much technical exposure are many: inactive communication, laziness, a potential link to ADHD, and a disinterest in family or social settings. On the flip side of the coin, there are plenty of benefits of technology. For example, with cell phones, parents are able to keep tabs on their kids after-school and when they're out with friends. This benefit has eased the worry of where-abouts amongst many parents. 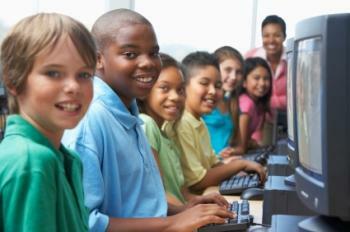 Early computer skills have also helped encourage kids to adapt to the tech-world introduced in educational settings, helping to stimulate an interest in a skyrocketing occupation. In an eye-opening study, most parents of high school students spend an average of only four minutes daily having real communication with their kids. Without a strong family bond and daily contact, parents may lose sight of their children's mental well-being and take a back seat to gadgets and laptops. Has the great indoors replaced the great outdoors in your home? While technology opens a door to the fascinating world of discovery, there is nothing quite as pleasurable as a long walk outdoors. Nature provides an abundance of learning, and children should never be restricted from outdoor play. At minimum, kids need at least 30 minutes of outdoor activity and exercise daily to prevent obesity. If you have a tech-savvy child in your home, you can still cater to his interests while promoting a healthy and active outdoor lifestyle. Make sure you set up or schedule outdoor play dates. Nature walks, treasure hikes and a day at the beach should never be replaced by computers or laptop screens. Take her to the zoo, museums, and libraries to enrich her mind on all levels. Remember you are in control of how much you allow technology to impact your child. While technology is growing with no end in sight, parents may choose to limit their children's exposure to high-tech toys and computer and gaming systems. Just because a certain gadget may be a trend, doesn't mean your child needs it. As a family, you can discuss what gizmos and gadgets interest her, and determine a reasonable set of rules which will be applied to the usage of the purchase. Better yet, get involved in her interests and play an active participant in her time spent using the technological device. Family gaming systems such as the Wii are a wonderful way to incorporate technology into the home without losing sight of family time. As long as you are involved in the technology that he is exposed to, you can both journey together on the fascinating and futuristic superhighway while encouraging a healthy lifestyle and enriching your emotional bond.